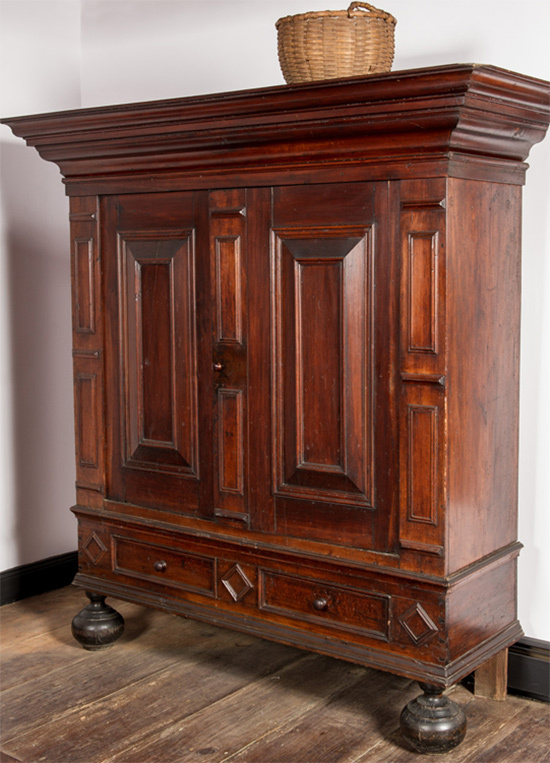 Historic Huguenot Street (HHS) is pleased to present the online exhibit Kasten from Mid-Hudson Valley Collections, featuring over one dozen 18th-century American cupboards. Based on a furniture form popular in the Netherlands, kasten were adapted in the Hudson Valley for over a century. Although variations exist, the typical kast (plural kasten) is a large, free-standing cupboard with two paneled doors surmounted by an over-scaled cornice. The cupboard usually sits on a base with a single drawer or drawers and ball-shaped feet. Some simpler versions made by country craftsmen feature cut-out or stylized feet. Kasten were central to domestic life in colonial New York. While serving a utilitarian function as the primary storage for linens, these impressive pieces were quintessential to the furnishings of Dutch-American homes, signifying the heritage of the owners, as well as their wealth and social status. The exhibit highlights the enduring influence of Dutch culture in the Hudson Valley. The online exhibit is based on the original exhibition Kasten from Mid-Hudson Valley Collections, held at Historic Huguenot Street in the Jean Hasbrouck House and the Abraham Hasbrouck House, October 1 through December 17, 2017. The exhibition gathered over a dozen of these important cupboards from prominent regional private and public collections, including examples from Historic Huguenot Street’s own holdings. 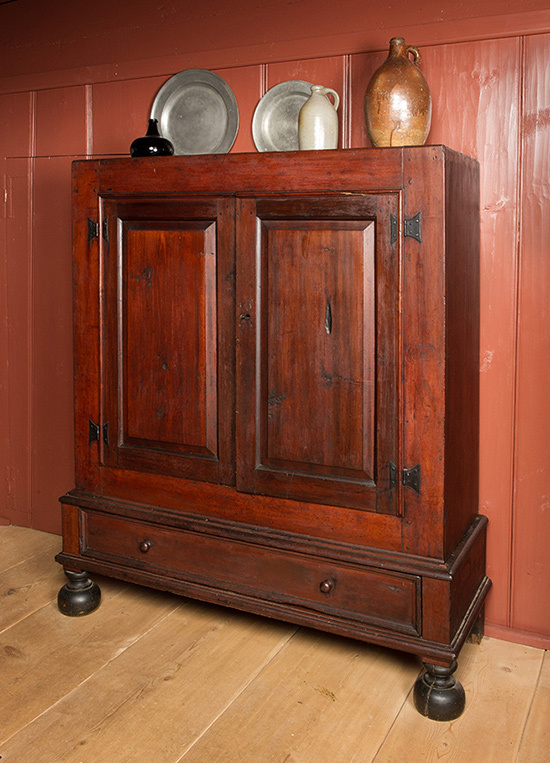 A 17th-century Dutch-made kussenkast with connections to the Elting family and Huguenot Street is also featured from the Historical Society of Newburgh Bay and the Hudson Highlands. This remarkable piece features elaborate rosewood and ebony ornamentation and thick “cushion-like” doors. A cupboard from the Ulster County Historical Society shares an over-scaled cornice and other elements with Hudson Valley kasten, yet is identified as a schrank or German-style cupboard, owing to its distinctive interior design and other details. For more information about tours, programs, or exhibits at Historic Huguenot Street, please visit our website huguenotstreet.org or call 845-255-1889 (Visitor Center) or 845-255-1660 (Main Office). 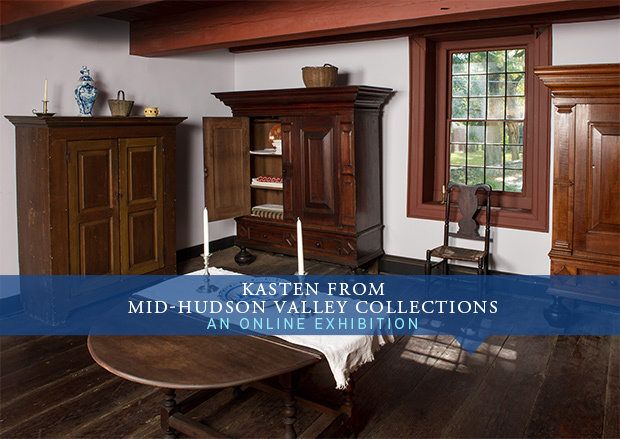 Historic Huguenot Street (HHS) is pleased to present the online exhibit Kasten from Mid-Hudson Valley Collections, featuring fifteen 18th-century American cupboards. Based on a furniture form popular in the Netherlands, kasten were adapted in the Hudson Valley for over a century. Although variations exist, the typical kast (plural kasten) is a large, free-standing cupboard with two paneled doors surmounted by an over-scaled cornice. The cupboard usually sits on a base with a single drawer or drawers and ball-shaped feet. Some simpler versions made by country craftsmen feature cut-out or stylized feet. Contact us and submit your own pictures of Kasten. Contact us. You can also submit your own pictures of Kasten.